Some of the confusion of lately about whether Evolution is 'just a theory' or if it is factual has to do with a general misunderstanding of what science is. Some time ago, I quoted Derren Brown who said this about that: "Science is unusual in that it is cumulative. 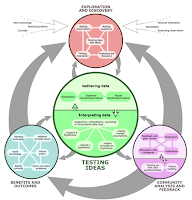 It is a system built over time, wherein useful information is retained and ideas that simply don´t stand up are discarded, based on the confirmation of knowledge through testing. Science, like technology, is inherently progressive and by definition represents the model that can be shown to work best. ... [w]e live in a time when misguided aspects of relativist thinking are still around us and unscientific, scaremongering stories are popular with the media. Scientists are painted as the corrupt hacks of evil big business, and as proper thought is too easily drowned beneath waves of misinformed public feeling, we often forget the importance of evidence-based fact." If you'd like to understand more about science or want to find a great tool to explain science to others, Understanding Science is the place to start. Thanks for the great post, I too believe that science is the key to understand almost everything. To blindly believe in something is not the way to go when something has to be proved. Well known facts and axioms should be the core of every scientific project. What's sad is that this is what the new scientists often lack, depend on unsubstantiated data. People ought to be informed what real science is about. Hi Lorne, thanks for your comment. Are you a scientist yourself? Nope, I am just a huge fan of science and technology. I would love it if I had the ability to discover and research new ideas. I was just never good enough in proving things, I never quite got the mathematical induction proof...haha.